The Dingo Pup drew a unified response of thumbs up from the judges at Mudgee. Its affordability, fresh features, and ability to keep things simple without making compromises all featured heavily in their assessments. It’s got all you need for a trip away into the outback, they say, without you having to take a trip to the car dealership first. 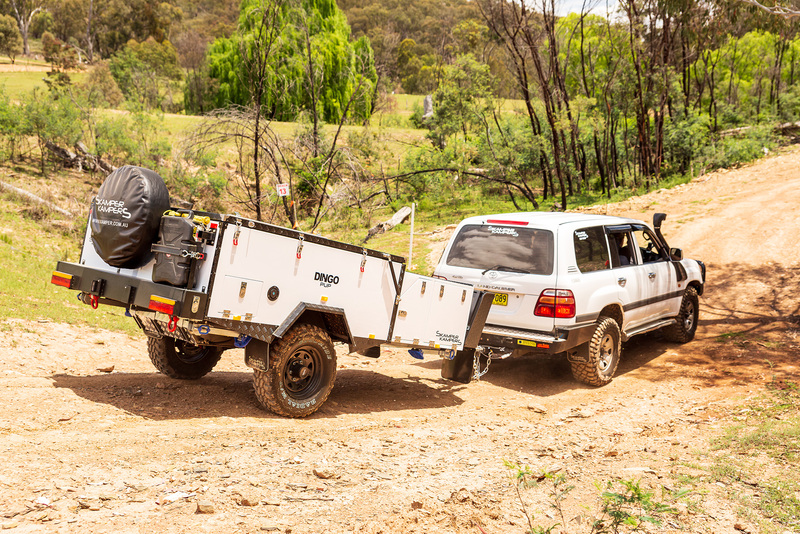 The Skamper Kampers line-up of Dingo hard floor campers now features the lightweight Dingo Pup; safe to say, the Pup gives little away to its bigger brothers. 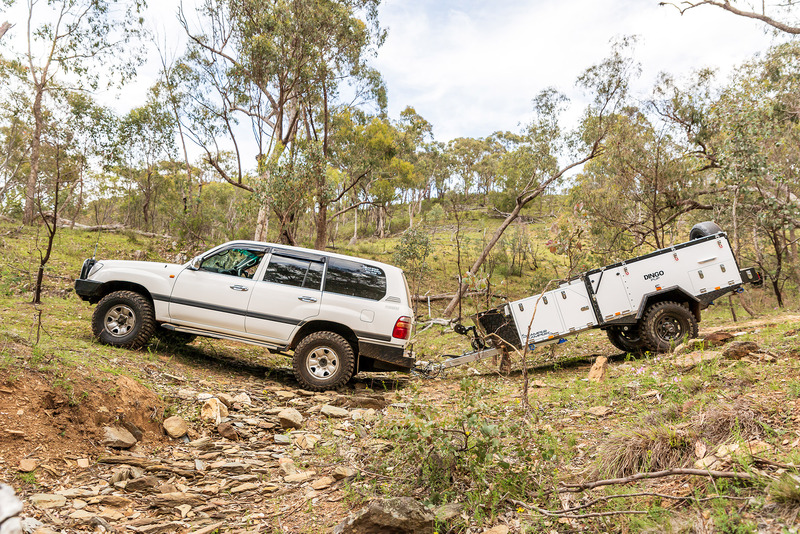 This forward fold has a Tare weight of just 1160kg and an ATM of 1600kg, making it ideal for towing behind a medium size SUV or 4WD. But that doesn’t mean Skamper Kampers have stripped the camper, such that it wont make it around Oz or to your favourite camping spot. Far from it. In fact, its chassis design, with one-piece continuous chassis rails from front to rear, is one of the best I’ve seen, anywhere. It’s more reminiscent of a good quality heavy duty boat trailer than standard RV fare. Plus, this 100x50x3mm hot dip galvanised chassis comes with a five year structural warranty. Up front there’s a McHitch 360 offroad coupling, an Ark heavy duty swing-up twin jockey wheel, and four drop-down stabiliser legs. You’ll also find the separate insulated fridge compartment and a sliding drawer ideal for a pantry. The front end of the camper is finished off with a solid stoneguard to protect not only the camper but also the jerry cans and gas bottles that can be tucked in behind it. The suspension is an independent trailing arm setup with dual shock absorbers. The stub axles have parallel bearings, while being fitted with 15in black steel wheels with a six-stud LandCruiser pattern and 10in electric brakes. As with any camper that has a longish drawbar, the turning circle plus ramp over and departure angles compromise the camper’s offroad-ability. That said, most people would only find that out, if ever, on the most gruelling tracks. Skamper have also done some smart things with the tent, or, more precisely, with its frame and how it erects. A Quick Lock pole system takes much of the hassle out of erecting the canvas and makes the whole operation simpler and quicker. Finally, I have to say, what a great price for a camper that delivers all the basics for a weekend away or a longer trip around Oz. I had to ask three times to verify the price as it seemed so inexpensive for what you got. 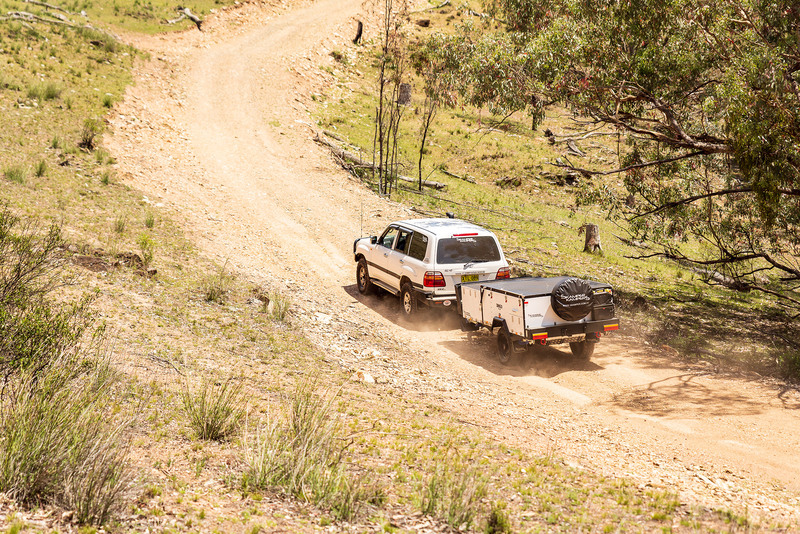 It may miss out on many of the frills you get with more expensive campers, but what the hell – what you save you can spend on travelling and customisation. 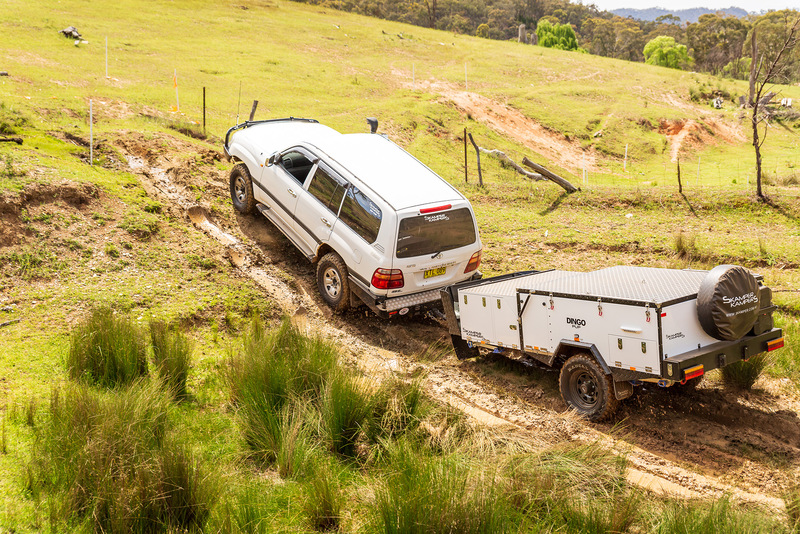 At $16,000 plus on-road costs (as shown at REDARC CTOTY), the Dingo Pup was the lowest priced entry at this year’s contest – but it was far from the lowest specced. While it is a reduced size version of your standard forward fold, this offering lacks little in detail. 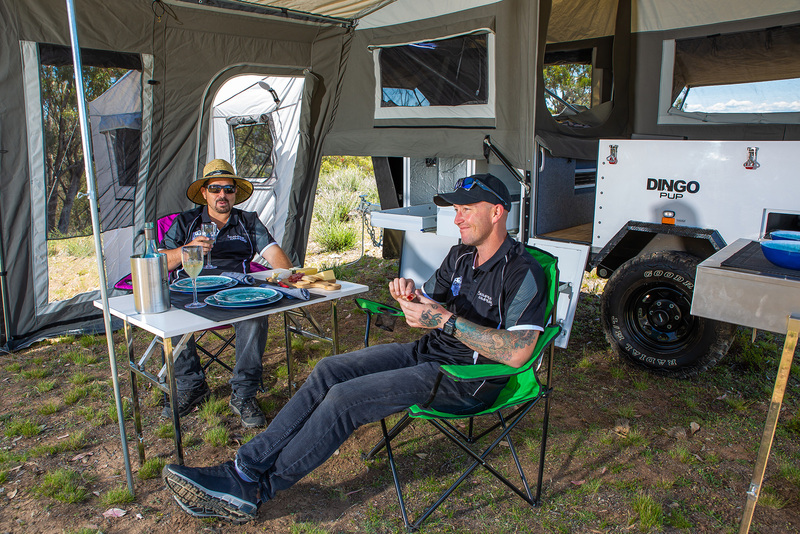 The Dingo Pup and its crew of two triumphed in the event’s camper setup contest, with the trailer disconnected from the tow vehicle, tent fully opened, touring awning out, stabilisers down, kitchen and fridge out, and operators sitting comfortably in their camp chairs in just four minutes and 27 seconds. That’s a pretty good indication of its user friendliness at the end of a long day. 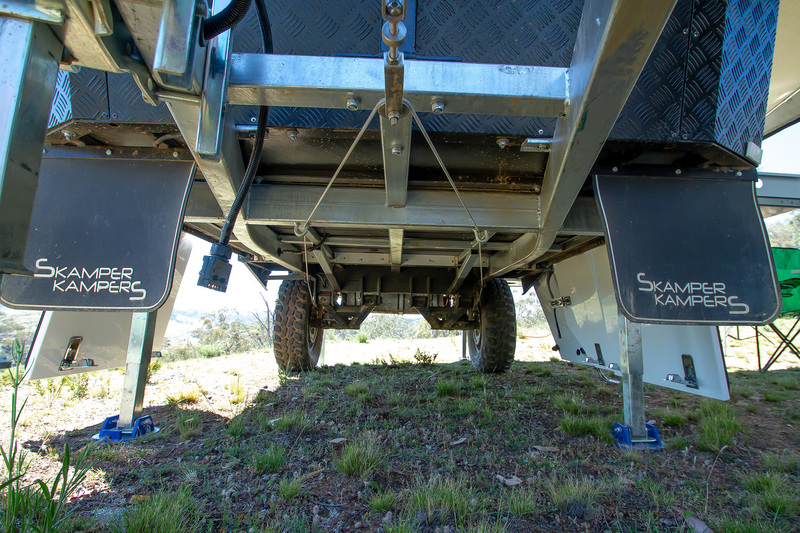 This is a camper that’s aimed squarely at those with a smaller tow vehicle, whether it be a soft roader or a non-4WD vehicle; and with a 1160kg Tare, an ATM of 1600kg and a 100kg ball load, it meets those design parameters with precision. Skamper Kampers have applied a reasonable degree of innovation to the Dingo Pup. Take, for example, the likes of a RAAWcon main awning pole fitting to reduce the complication of awning setup, and a Quick Lock spreader bar anchoring to secure the bars with a carabiner clip rather than the old hook and loop system. Add to that rear pole storage to reduce ball weight, a uniquely designed flexible kitchen layout, and a storage bag to attach to the O-Track tie-down slides on top. Not to mention all your usual features. You can see this is a camper that’s been given some extra thought. If you’re in the market for a camper but would rather avoid the expense of upgrading your tow vehicle, take a look at the Dingo Pup. Skampers Kampers say, “Lightweight... but no compromise on space or quality.” I’ve got to agree! The victors from last year’s competition returned this year, with yet another excellent presentation that is likely to take the market by storm. The Dingo Pup is a slightly smaller and lighter version of its larger namesake, managing to provide almost all the features but in a slightly more compact unit, and at a price to tempt. In fact, at only 1160kg Tare and 100kg ball weight, and with a good offroad suspension and strong full length rails to the chassis, the Pup has a surefootedness that perhaps outperforms its very capable parent in the bush. It’s slightly more compact inside, but it still offers the full fold-over convenience, with that ever-popular layout of double bed up front and a U-shaped dinette to the rear. Its lighter weight and smaller dimensions make life so much simpler for those with mid-range RVs or even commuter vehicles, enabling them to get out of town and enjoy the camping lifestyle. 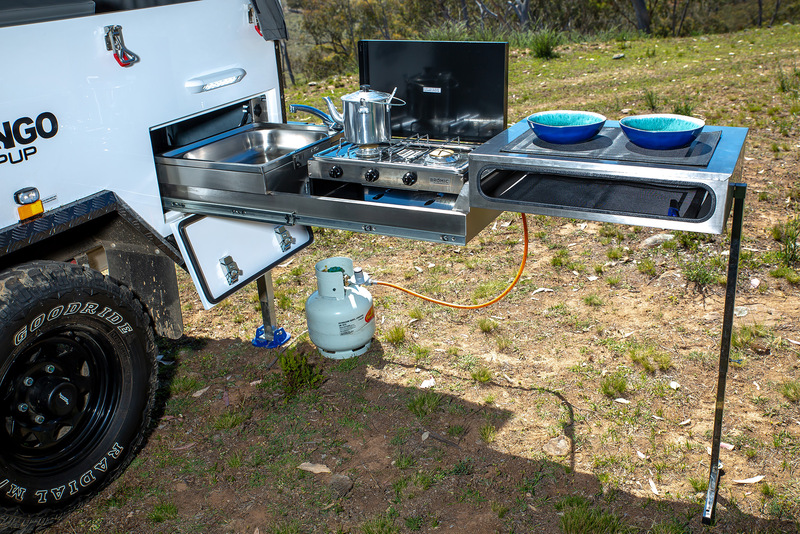 The Pup has all of the liveable features we love from Skampers, with a terrific stainless steel kitchen, large insulated fridge box and slide, and plenty of storage compartments to carry the pantry and gear. It’s easy to use and has a large main tent, with full length annexe and all the enclosures for an overnighter or long holiday in paradise. Skamper Kampers are constantly developing means of making our lives even simpler and more pleasurable, by utilising new ideas such as the Quicklock Pole System, pole and fishing rod storage at the rear, and the aforementioned tent that takes minimal time and effort to set up at the end of a long drive. There’s the option to add a hot/cold shower, plenty of lighting options and a six-seater lounge that converts to yet another double bed via a drop down table – all of this under very solid 15oz canvas with detachable walls and floor for the annexe, plus an ensuite. All things considered, the Dingo Pup supplies a very welcoming and comfortable living environment for life in our great outdoors. Priced at $16,000, I thought the Skamper Kampers Dingo Pup was a bit of a revelation. 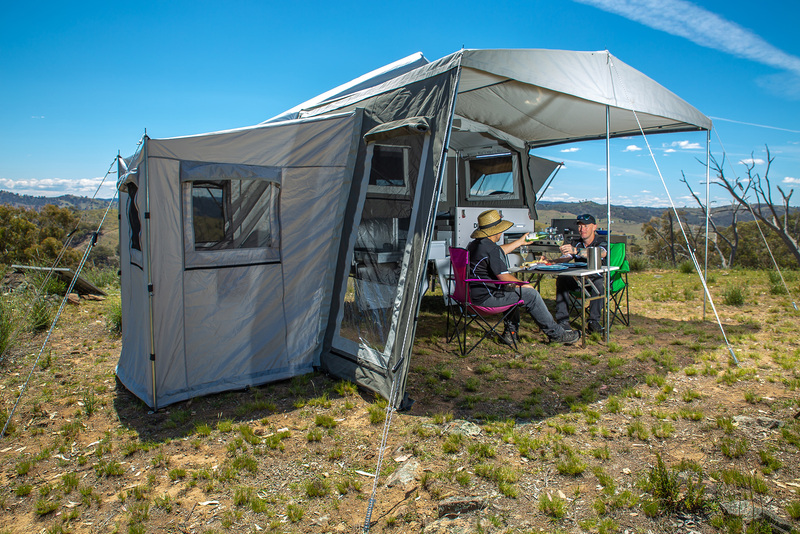 This affordable, compact forward fold camper has plenty of budget-level comforts packed into its diminutive shell and would be a great buy for a couple or young family looking to enter the camper trailer market. The Dingo Pup on test had a basic but functional electrical setup. There’s just one 100Ah AGM battery, but you can option up a second battery, which can be housed under the rear dinette seat. However, you’d likely make do at that capacity, because the insulated fridge compartment only fits a 50 to 60L fridge (which you’ll need to supply) and apart from the LED lighting you don’t have much else to keep running in this pocket-rocket. 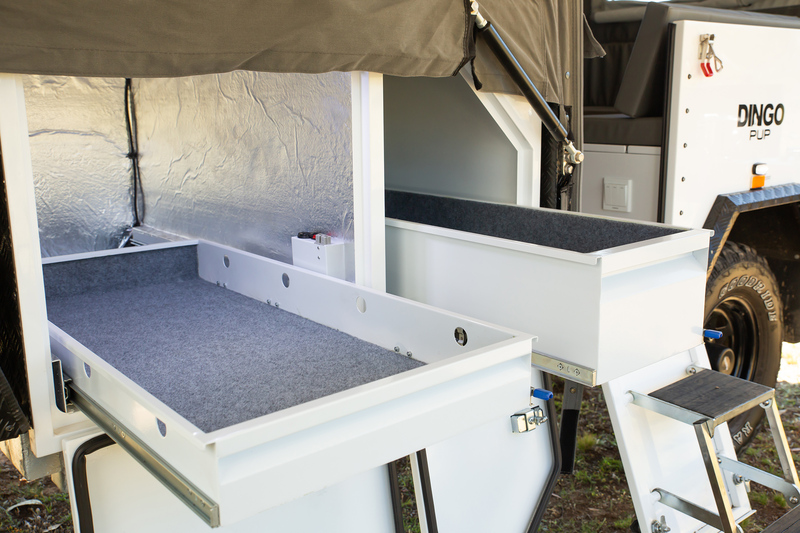 The water gauge, battery monitor, isolation switches, power and internal lights are all controlled centrally from the control box on the camper’s side. The Pup also came fitted with a CTEK charger, 50 amp circuit breaker, two 12V sockets and a USB point for charging in the dinette area, and an Anderson plug for your solar panel. There’s no solar included as standard, so you’ll need to bring your own or option up for the 160W panel, in order to improve self-sufficiency. The 120L stainless steel water tank with aluminium bash guard can be topped up via the three 20L jerry cans, offering a bonus 60L of water (or extra fuel), should you have kids onboard or if you plan on camping off-grid for a while. Two 4kg gas cylinders are stored at the front of the camper and, as with most forward folds, are difficult to access once the camper is set up. 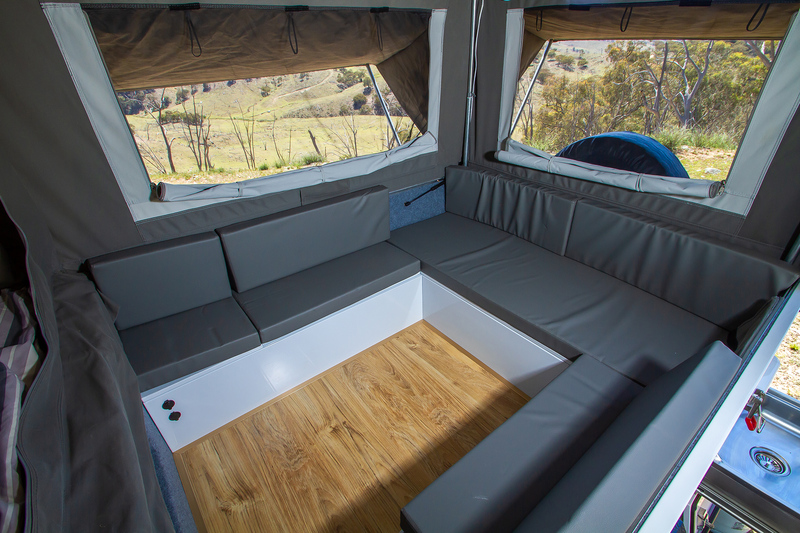 With sensor lights in the storage box and fridge compartment, and LEDs in all the right places throughout the annexe, bedroom, dinette and kitchen areas, you’re pretty well set for some hassle-free adventures in the Dingo Pup.